I was sitting in my office when I heard the news. A CBC reporter called me to ask what I thought. It was the first I was hearing of it so I really couldn’t give him an answer until I read it for myself. A 15% tax on all foreign buyers starting August 02, 2016. The Metro Vancouver foreign buyer tax does not target foreign capital and the many loopholes buyers can use to purchase property. None the less it seemed like a giant step forward from a government who denied the issue entirely only several months ago. So I guess not everyone is happy about the new tax. The government is going to tank the market and kill the economy. Restricting foreigners is prejudice and we are a welcoming society. Vancouver has always been expensive, if you can’t afford it then move. First off the BC Liberals have been so opposed to tinkering with the market from the start. They have been adamant about protecting peoples equity in their homes. If they felt this was going to tank the market I highly doubt they would have made such a move. Secondly, an economy propped up entirely by real estate is an absolute disaster. The economy will tank regardless of foreign buyer restrictions if it keeps up this torrent pace. What about restricting foreign buyers being prejudice? Many cities across the world already impose restrictions on foreigners. Such as Hong Kong, Australia, United Kingdom, Singapore, Thailand, and PEI- yes Prince Edward Island in Canada. You can read all about those restrictions HERE. Anyways Hong Kong also charges a 15% tax to any non resident. So is Vancouver really that prejudice? The other argument I got was Vancouver has always been expensive, if you can’t afford it then move away. This statement is true and I certainly don’t think anyone should be given a free ride just because they grew up here. But let’s think about that for a second. Firstly Vancouver has never been more unaffordable to live in. It’s surpassed New York for unaffordability. Yes their real estate is more expensive but their incomes are also much higher. 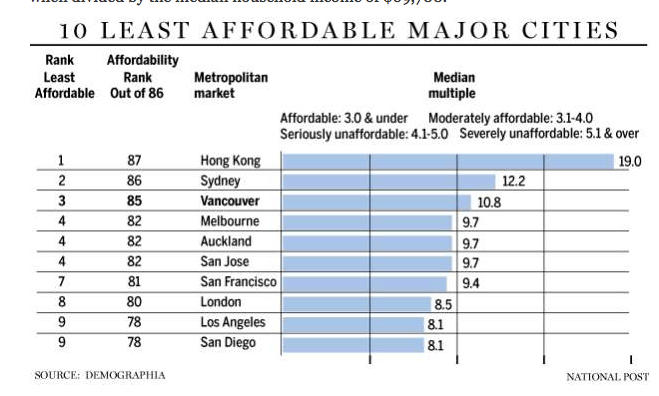 Vancouver now ranks third most unaffordable city in the world as per a study below cited in the Financial Post. The Vancouver foreign buyer tax is a strong step forward to levelling the playing field for locals who earn their incomes and pay their taxes here. And I know it’s something young professionals and millennials alike are happy about. What the tax fails to address is the issue of foreign capital. 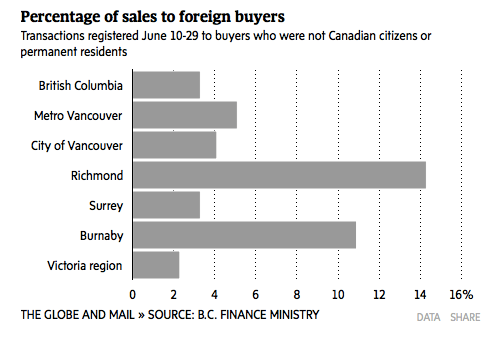 As per the BC Governments finding, only 5% of homes in Metro Vancouver were purchased by foreigners. A number that is drastically under reported. The 5% figure does not include homes listed under shell corporations, astronaut families, and foreigners who come through the back door using the Quebec immigration program. A significant amount of sales are done using these loopholes. If these kinds of deals where subject to the 15% tax then surely it would have a much greater impact on Vancouver real estate prices. Perhaps this is why the BC Government has chosen to tax only foreign buyers and not foreign capital. Anyways, time will tell if this move will actually have an affect on Vancouver real estate prices. Perhaps short term, maybe long term. Will it change the psychology of buyers and sellers? I’m not going to speculate. If you ever want to know Why I stopped Predicting Vancouver Real Estate Prices it’s because of days like today. Where out of nowhere the Government decides to make history and impose a tax they’ve been fighting for years. Who would have guessed.